I recently wrote an article about Inflation in Zimbabwe, which has recently passed the 100,000% causing widespread hardship for the population. Definition of Hyperinflation: A rapid and unchecked increase in the price level. Typically it may involve inflation rates of greater than 100% or greater than 1000% Hyperinflation is often reported per month, or even per day. Another distinguishing feature of hyperinflation is the idea that inflation is out of control. i.e. not only are prices rising rapidly, but the rate of increase is rising rapidly as well. With each cycle inflation gets worse. Printing Money. To cope with meeting the debt, the government starts printing money. This decreases the value of existing money creating a multiplier effect where people lose confidence in money and keep demanding wage increases. Reluctance / inability to deal with it. 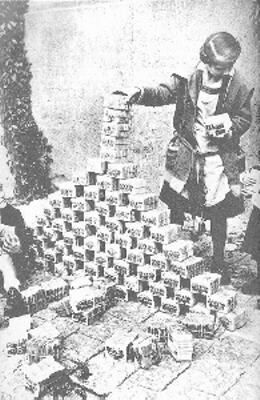 When Germany experienced hyperinflation in the 1920s it was not a phenomena they fully appreciated or understood. Their primary fear at the time was unemployment. They feared that unemployment could precipitate a Communist Revolution so they didn't want to do anything to reduce demand and possibly cause a recession. 1. Value of Savings falls. In a modern economy, interest rates are usually higher than the inflation rate. For example, if inflation is 5%. Interest rates may be 7%. Therefore, if you keep money in the bank or insurance fund, you maintain the real value of your money. However, when inflation becomes excessive, the rate of inflation is usually much higher than any potential interest rate. Therefore, people with savings see the real value of their wealth wiped out. There is the story of people in Germany who began a saving scheme in 1903. For 20 years they put 10% of their wages into a pension scheme. When they cashed they pension scheme in 1923, it gave them enough money to buy a cup of coffee. 2. Menu Costs. These are the costs of dealing with rapidly rising inflation. A consumer noted that the price of coffee was 5,000 Marks. He ordered one cup of coffee and when he finished drinking that coffee, he ordered another one. When the final bill came to 14,000 Marks he was told that the price of coffee and increased during the time he was drinking the first one. When people got paid at 10am in the morning, they would have to spend it straight away, otherwise the wage would become worthless. There is the story that to pay teachers, the money had to be carried in a lorry. When the lorry came and distributed the wheelbarrows of money, the teachers gave it to relatives who would go off and buy goods straight away. The experience of inflation can become engraved on people's mind making them suspicious of financers, bankers and the general economic system. It is no coincidence the Nazi party were able to feed off these suspicions to introduce extremist policies. Ultimately hyperinflation causes people to have lower spending and firms lose confidence in investing. This can cause the economy to slow down and reduce living standards. Is it Rational To Buy Things Twice?